The world has always been fascinated with ancient Egypt. When the Romans conquered Egypt, it was really Egypt that conquered the Romans. Cleopatra captivated both Caesar and Marc Antony and soon Roman ladies were worshipping Isis and wearing vials of Nile water around their necks. What is it about ancient Egypt that breeds such obsession and imitation? 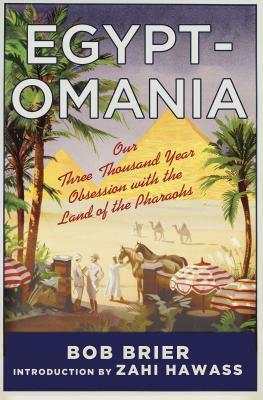 Egyptomania explores the burning fascination with all things Egyptian and the events that fanned the flames--from ancient times, to Napoleon's Egyptian campaign, to the Discovery of Tutankhamen's tomb by Howard Carter in the 1920s. For forty years, Bob Brier, one of the world's foremost Egyptologists, has been amassing one of the largest collections of Egyptian memorabilia and seeking to understand the pull of ancient Egypt on our world today. In this original and groundbreaking book, with twenty-four pages of color photos from the author's collection, he explores our three-thousand-year-old fixation with recovering Egyptian culture and its meaning. He traces our enthrallment with the mummies that seem to have cheated death and the pyramids that seem as if they will last forever. Drawing on his personal collection -- from Napoleon's twenty-volume Egypt encyclopedia to Howard Carter's letters written from the Valley of the Kings as he was excavating -- this is an inventive and mesmerizing tour of how an ancient civilization endures in ours today. Bob Brier, known as Mr. Mummy, is a Senior Research Fellow at Long Island University/LIU Post and the author of eight books, including The Murder of Tutankhamen. He has conducted pioneering research in mummification practices and has investigated some of the world's most famous mummies, including King Tut, Lenin, Ramses the Great, Evita, and the Medici family of Renaissance Italy. He has conducted research in pyramids and tombs in 15 countries and was the host of several award-winning television specials for TLC, including the blockbuster series Pyramids, Mummies & Tombs and Mummy Detective. In 2010 National Geographic TV presented his documentary "Secret of the Great Pyramid." A contributing editor to Archaeology Magazine, he also writes articles for many other magazines, including Smithsonian, and KMT. He lives in the Bronx, NY.